Coldilocks the polar bear looks up from a nap at the Philadelphia Zoo in Philadelphia. 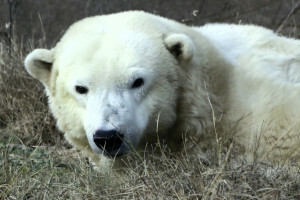 Coldilocks, who celebrated her 36th birthday last week, is considered the oldest polar bear in the U.S. The bears' typical lifespan in captivity is 23 years. Coldilocks the polar bear looks up from a nap at the Philadelphia Zoo in Philadelphia. Coldilocks, who celebrated her 36th birthday last week, is considered the oldest polar bear in the U.S. The bears’ typical lifespan in captivity is 23 years.